This morning I woke up to cool temperatures, only 66 F (19C) and I will be going to bed with temps in the high 90s (39C). As I am writing this at 9:30 PM it is still 102 F. You wonder where I am or where I was. Well, I slept in Show Low, Arizona. 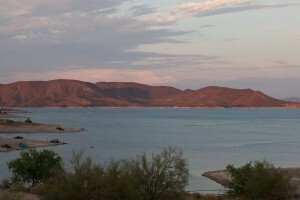 That is in the in the north eastern section of the state at an elevation of about 6,400 feet, and I am going to bed 50 miles northwest of Phoenix at Lake Pleasant at an elevation of a measly 2,000 feet. It is pleasant, but only in the water. I can’t even take a cold shower. The water from the cold water faucet is as hot as regular hot water. I shouldn’t complain. This morning I thought I was in Colorado. The stretch from Show Low to Payson along hwy 260 was all pine forest, great smell. Unfortunately, big sections of the forest to the sides of the highway were burned. Not sure when those fires took place. Driving through the mountain passes was fun, mostly because I was going downhill, for the most part. There were some sections where the forest opened up and I was looking over great mountain ranges. I wish the highway department would take into consideration that people might want to stop and take a closer look and build turn outs when they redo highways. No photos. The scenery changed drastically when I headed south from Payson on highway 87. Forgot to mention, I got up really early, 5:30 AM local time. That was 6:30 AM my body time. For some reason, Arizona does not have daylight savings time. Figured I get an early start to avoid some of the heat. In any case, I had a second breakfast at the Small Café in Payson. Nice family run place. Just a mile or two out of town the Arizona desert opened up in front of me. 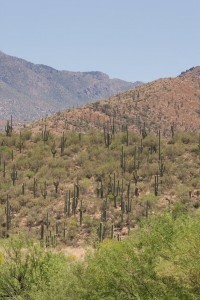 Huge Saguaro cacti to the left and right in the mountain valleys. No more pine trees. Once at the campground, I did go for a dip in the lake. Nice and refreshing. How I got from Texas to Arizona is a story for the next blog or two. try to check out the area around sedona and north to flagstaff …very beautiful part of the state. Thanks Phil. I actual visited that area 14 years ago, almost to the day.